All animals learn. They learn in two ways – by seeking to increase pleasant feelings or minimize unpleasant feelings. Training works when the trainer substitutes for nature and either presents an aversive stimulus (pressure) that the horse is relieved of when it moves away (negative reinforcement), or presents a positive stimulus that the horse gets more of when it approaches (positive reinforcement). It’s in the nature of training that we should leverage both – provide a lightly aversive stimulus (e.g. leg or bit pressure) and then provide a negative reinforcement when the horse does the right thing – releasing the pressure – and finally a positive reinforcement (“good boy” or a wither scratch) after the release of pressure. Ron Meredeth of Meredeth Manor speaks of the “corridor of pressure” – perhaps more correctly called the “corridor of no pressure”. This fits neatly with Andrew McLean’s concept of self-carriage – the situation where the horse correctly finds the three dimensional position (two dimensions of space and one of time) that leads to an absence of pressure at all times. This relaxed and relieving place is when training has been successful and the purpose of the trainer or rider is only to provide the edges of the corridor of pressure when the horse trespasses on them, using a feather light brush. Buck Brannaman speaks of preventing the horse from getting in trouble by anticipating trouble and heading it off before it arrives. Though not as systematic or consistent and Meredith or McLean, his concept is understandable in that context – a light pressure at the beginning of trespass causes the horse to realize what’s correct and what’s not and where the “wall” of the corridor of movement lies. So if you think of training as starting with pressure, accepting a basic attempt that even slightly responds correctly to the pressure, removing the pressure, rewarding, resting and repeating – gradually shaping the basic attempt through the stages of obedience, rhythm, straightness, contact and proof, then where is the role of punishment? Shaping is about timing. The horse feels a correction as a slight increase in pressure as it starts to do something that does not fit the shape or path you are communicating. The quicker the timing, the gentler the correction, the faster the learning. In a less focused corridor, it’s not so clear where the walls are; in a crisper corridor, the boundaries are clearer and easier to learn. Of course, if the corridor is too sharp and too unforgiving, the horse is also confused – “when am I right”? Amidst this careful art, correction is immediate and understandable, punishment is delayed and confusing. If a horse does something incorrectly and you leap off and strike him with a whip, it’s impossible for the horse to understand his error – so he is “within his rights” to feel unreasonably attacked. What did he do wrong? Stop? Stand? Look at you? How sad is it to so confuse the horse and, worse yet, to do so with pain it can’t possibly learn from due to the nature of its intellect and the point at which it can no longer be aware of events as connected by cause and effect. Horses are not people, they don’t perceive time, or the connections between events, as we do. People are constantly aware of the fourth dimension of past and future and they are constantly working forward and backward along their timeline to anticipate what they should do and to trace effects to causes in sometimes far distant prior events or actions. Horses, on the other hand, are more limited and their introspection is probably barely existent. They understand the moment, but not so much about the moments that precede them, and even less about the moment that is to come. So punishment is a sad injustice and leads to nothing but a generic anxiety. It’s not a proper part of any training method. It’s a curse word and an aggression that only creates uncertainty and tentativeness. A confident horse is difficult to create… a prey animal trying to survive in a world of rapidly moving predators will necessarily feel insecure until the frightening humans have demonstrated a consistent and safe environment where the horse always has some level of success. Let’s create confident horses and avoid punishment. Horses do need to know when they are doing the right thing. While the relief of pressure or the lightest possible aids represent the basic indicator of a good performance of a known maneuver, in more advanced training things can be more ambiguous for the horse. Physical training stage: Trainer pats the horse’s sides with his legs. The horse does not put its head down. 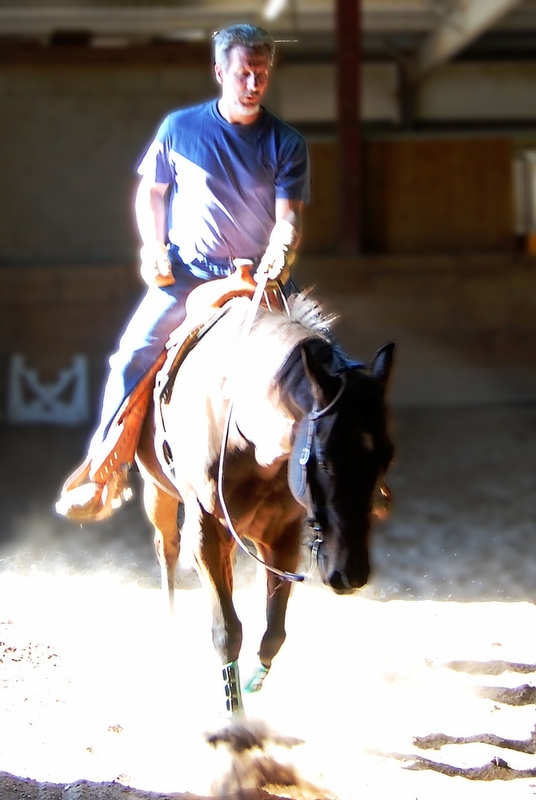 The trainer lightly alternates the reins until the horse moves its head down at all, at which point he uses negative reinforcement by removing the pressure represented by the rein motion. First indirect operating stage: Trainer pats the horse’s sides with his legs. The horse lowers its head. The trainer stops the leg motion. Second indirect training stage: The trainer lifts the reins. The horse does not respond. Trainer pats the horse’s sides with his legs. The horse either responds or not. If it responds, use negative reinforcement by stopping the leg pat. If not, use physical stage cue. Second indirect operating stage: Trainer lifts the reins. Horse lowers its head. The trainer lowers the reins. In each case, the horse is told that he’s done the right thing by the release of pressure. Even the initial attempt is rewarded. And this is probably good enough for teaching a specific “thing to be done”. And when the horse is at the “operating stage” the removal of the pressure says it all. Where this falls short is when you are trying to put quality into a particular response, maneuver or set of maneuvers. Let’s take loping a circle. The horse tends to fall into the circle at one point and out of the circle at another point. The trainer corrects this with a shoulders in or out as appropriate. But how does the horse know that this is a correction? Theoretically the horse eventually takes on the same position either in an attempt or by coincidence or in anticipation, and then the rider does not apply the pressure. Again, theoretically, the horse generalizes the absence of pressure when it does not fall in or out as being the correct response and the circle improves. Well, that is, it might do that if you never asked for shoulders in / out on a circle. But if you sometimes have the horse do this as an exercise, then why would the horse think this was a correction rather than a simple request for a maneuver? Even if the pressure is left out when the horse does it himself, it might just be that you don’t want him to do that maneuver right now. But a “good boy” when the horse does not fall in or out at the expected position quickly gives the horse a feeling of efficacy and correctness – at least, if you’ve taken the time to create and maintain a “good boy” foundation in your horse’s mind. And it can be used anywhere else, such as after a clean depart, to strengthen desired behavior where negative reinforcement isn’t really available, and where it’s impractical to feed treats or even stroke in front of the withers. “Good boy” leverages “associative learning” – the pairing of two stimuli. One stimulus is the phrase (trainers and riders are well advised to use “good horse” unless they are sure they can remember “good boy” and “good girl” for stallions / geldings and mares respectively). 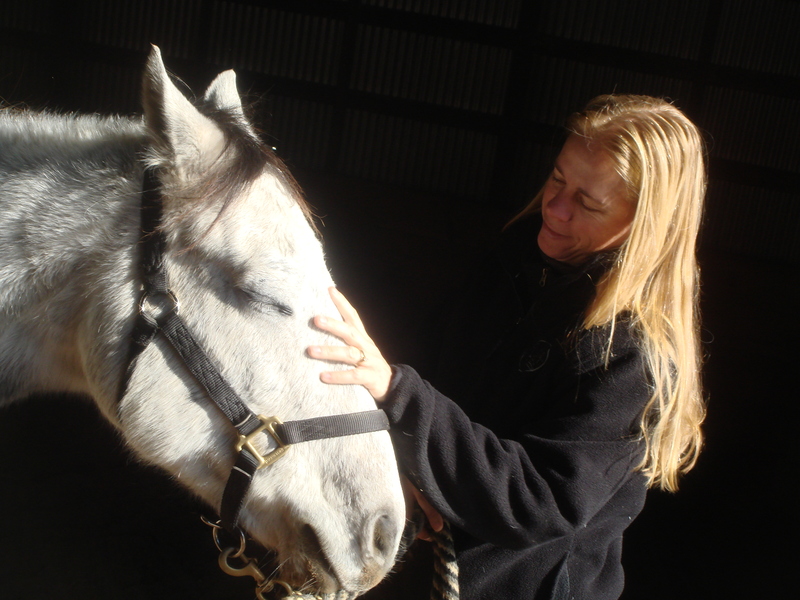 The second stimulus is something nice – a stroke in front of the withers (research shows this is the primary location for allogrooming and also lowers the horse’s heart rate), a treat, a bucket of water – whatever the horse may find pleasant. It’s probably a good idea to precede the pleasurable sensation with the “good boy” (or “good girl” or “good horse”). The reason for this is because otherwise the horse may react to the touch or the treat and not even hear the phrase. In addition, it generates the sense of anticipation that something nice will happen. You need to say this phrase the same way (same tone, pitch, phrasing, etc.). Horses don’t understand spoken language – they understand sounds. “Gudby” is not the same as “Goood bay” to them, even though we might hear them as the same. Building and maintaining the foundation means using this pairing technique every time you are about to do something nice to or for the horse. The more you use it, the stronger the foundation. You may start to find the horse licking and chewing when you use it from the saddle, as they re-experience the pleasant memories this recalls to them. Using “good boy” should be done as closely as possible to the correct action or the boundary of an inaction (e.g. “stand”). Timing, as in all areas of training, is critical. In addition, it can help to strengthen the “good boy” from the saddle by stroking in front of the withers right after saying the phrase. Remember, one of the keys to successful horse training is to help the horse be able to feel good about a good performance and be corrected when needed. “Good boy” can be used at any point where you get a good response, and can reinforce that “good job”.